Tong for grabbing snakes and reptiles from a distance. 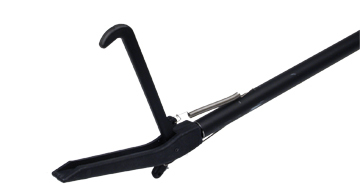 Extreme grip tongs have the same great features as our standard cast aluminum tongs with a different style gripping jaw preferred by some handlers requiring a stronger grasp. Model 315C is 42 inches long. Super strong nylon composit jaws & handle. Black Anodized Aluminum tube shafts to withstand the elements. Watch video below for proper Tong technique.